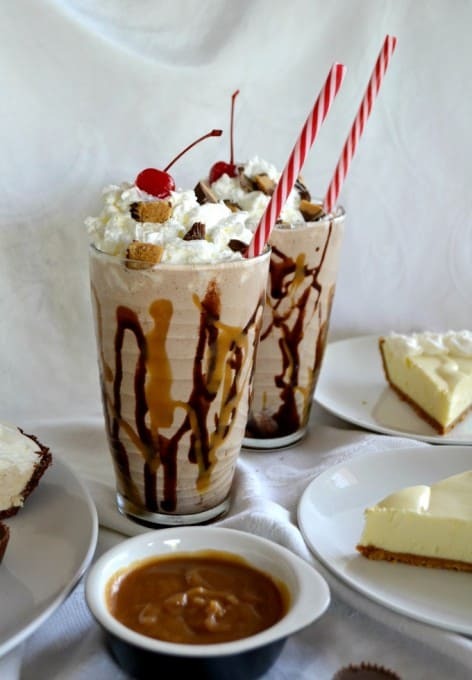 EDWARDS® REESE’S PEANUT BUTTER CUP® Crème Pie Shake – ice cream, milk, chocolate syrup, homemade peanut butter sauce, and a slice of EDWARDS® REESE’S PEANUT BUTTER CUP® Crème Pie make this the perfect summer treat! Sometimes I think I like it better than cake. I mean, there are SO many varieties. Not that there aren’t a lot of different cakes, it’s just pie tastes better to me. Besides, there’s fruit in quite a few of them, so there’s that. Cakes are BIG and a pies are just the perfect size. Kinda like Goldilocks and the Three Bears. 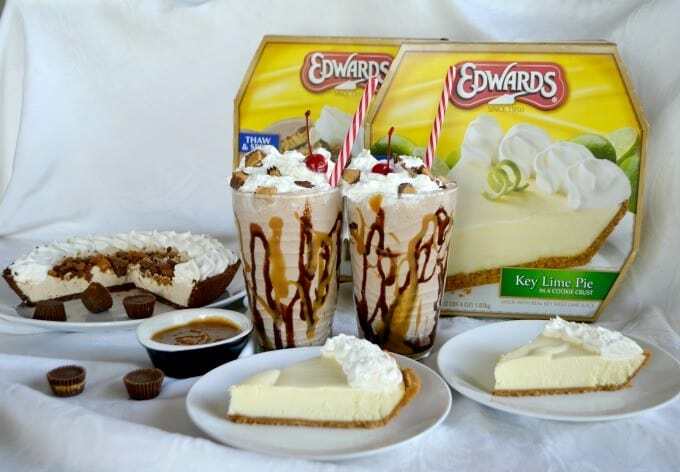 On one of my daily jaunts to Walmart last week, I saw EDWARDS® Whole Pies in the freezer section and after having a slice of cake in a milkshake a few month ago, I’ve been dying to try it with a slice of pie to see if it would actually work. Oh, man. It was a very good decision and one I look forward to making more often! I also picked us up an Edwards Key Lime Pie because believe it or not, I’ve never tasted one. Yes, it was pretty darn good and I look forward to having it again. Now you can save $1.00 on any ONE (1) EDWARDS® Whole Pie by taking advantage of the Walmart EDWARDS Ibotta digital rebate (while supplies last). 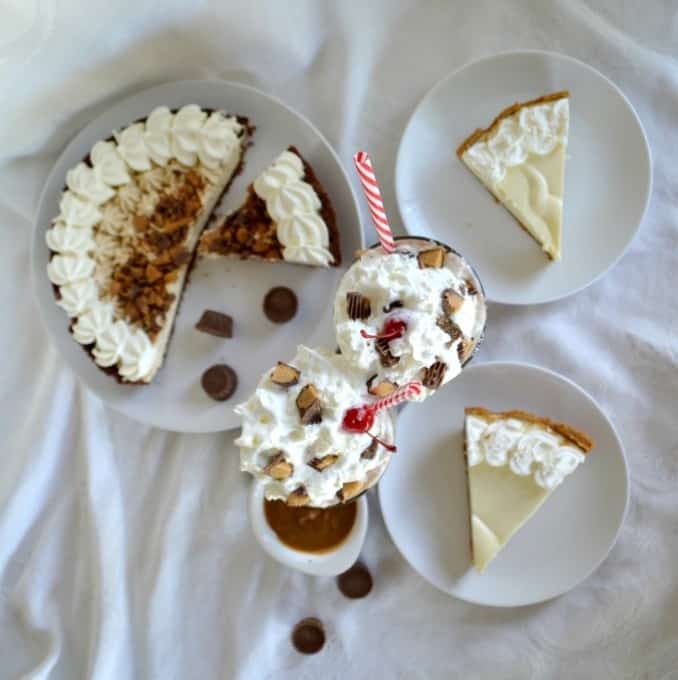 You’ll be able to pick yourself up a pie or two and enjoy your own pie shakes!! Both of the pies were hits with the family. It’s wonderful when I can relax from working so much in the kitchen and enjoy a dessert with everyone that I didn’t have to make. The night I served them, some of us opted for a slice of pie while others choose to go with the pie shakes. Of course, I was on the shake team. The best thing is, you don’t need a reason to buy a whole pie. You can serve one to celebrate your family, a good deed done for the neighbors, a really good catch in the baseball game, a big accomplishment, finishing that summer reading list, swimming under water for the first time, or “just because”. Bringing the family together and celebrating one another while enjoying some pie is what it’s all about! In a medium microwavable bowl, combine all of the ingredients for the peanut butter sauce. Heat for 30 seconds and stir until smooth. Will yield 1/2 cup sauce. Refrigerate any unused portion in a tightly sealed container and heat for 10 seconds in the microwave to soften. Will be fresh for 5 days. 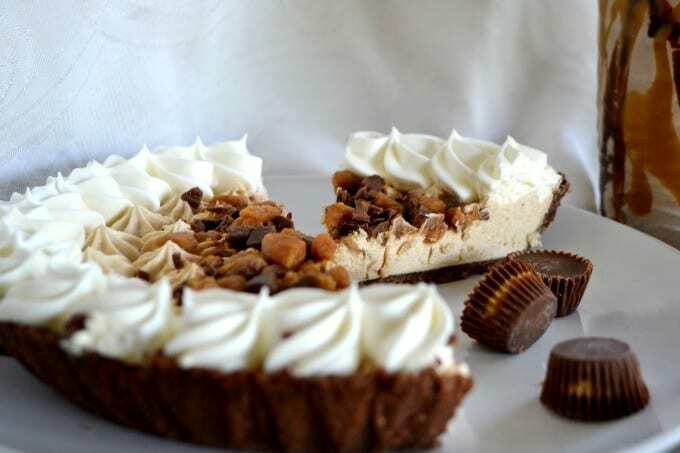 Remove the EDWARDS® REESE’S PEANUT BUTTER CUP® Crème Pie from its' carton and slice into six even slices. In a blender, place two of the pie slices, ice cream, milk, peanut butter sauce and chocolate syrup. Decorate serving glasses with peanut butter sauce and chocolate syrup. 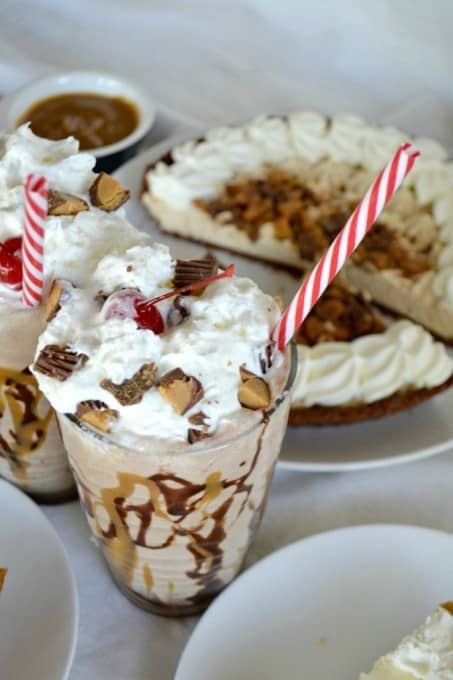 Pour shake into glasses, top with whipped cream, chopped Reese's Peanut Butter Cups, a maraschino cherry and serve. *If shake is too thick, add more milk by the tablespoon. I rate everything I make on a scale of 1 – 4 with 4 being the best and this EDWARDS® REESE’S PEANUT BUTTER CUP® Crème Pie Shake earned 4 rolling pins!!! Oh. My. Gosh was it good! The addition of the peanut butter sauce and chocolate really brought out those flavors and I could taste the little bits of crust with every sip. It is definitely our new treat for summer! Be sure to top yours with whipped cream and cherries as well to give them that little extra oomph and make it extra special. A piece of pie in my shake? I am ALL IN! I have seen the Edwards pies in the freezer section; putting it on my shopping list right now! I’m sold on pie > cake!! 🙂 Love that you made a milkshake out of pie. So awesome! I’m with you – I’m a pie girl all the way!! 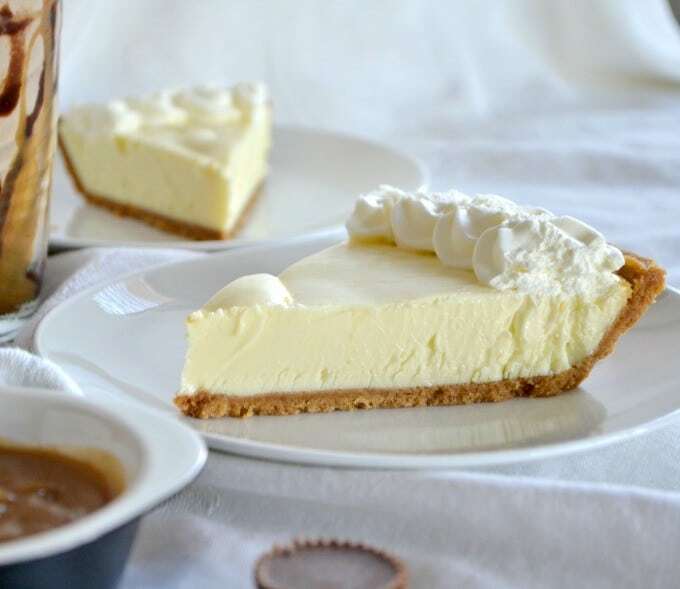 LOVE this, and it just may be dangerous since the pie is just a trip to the grocery store away! 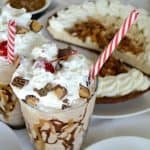 I love pie, I love milkshakes, and I LOVE this recipe! Can’t wait to make myself one of these! Thanks, Joan! I think you’ll enjoy every mouthful! Um…. I need this and one of those awesome extra thick straws that rocks!